Stone-throwing, Molotov cocktails, burning tires, and laser pointers - as attacks continue this morning across Judea and Samaria. A wave of Arab terror attacks have swept Judea and Samaria roads in the past 24 hours, according to Moked 443. Terrorists threw stones at passing vehicles last night near Al Fawar south of Hevron, damaging two vehicles as a result. Similarly, terrorists threw stones on the Husan bypass road near the town of Beitar Illit south of Jerusalem, damaging the windshield of a passing vehicle, and threw stones and Molotov cocktails at passing vehicles near Maale Adumim. On Route 458 northeast of Jerusalem, a woman reported a laser pointer being pointed at her face in an attempt to impair her ability to drive. 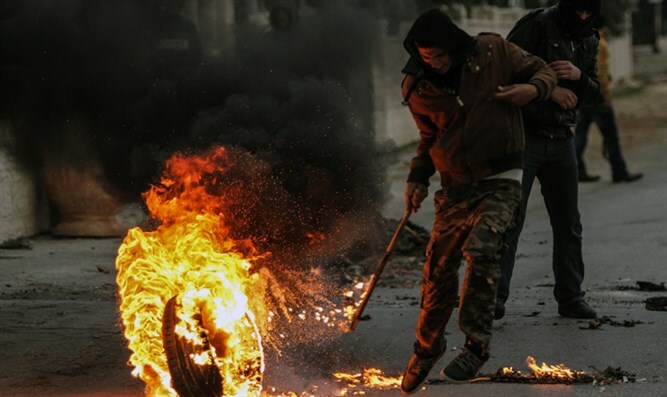 Near Ariel, a burning tire was reported to have been placed in the road. Security forces dealt with the incident. In the past several hours, more stone-throwing attacks were reported near Yitzhar in Samaria, and near the Arab village of Tekoa [not to be confused with the Israeli town of Tekoa nearby]. Miraculously, nobody has been reported injured in the most recent slew of terror incidents. The attacks come as Arabs have rioted in recent days at various points through Judea and Samaria, along the Gaza border, and in the predominantly Arab region of Wadi Ara, following US President Trump’s recognition of Jerusalem as the capital of Israel. The move was heavily criticized by European and Arab leaders, and was followed by a wave of riots across the Arab world. On Sunday, a security guard at Jerusalem’s central bus station was seriously wounded in a stabbing attack. Hours before the attack, the terrorist, a resident of the PA-controlled city of Shechem (Nablus) in Samaria, Abu Al-Keraa, wrote on his Facebook account that he hoped to “raise the banner” for “Allah’s sake”.